The initial thought on hearing this album was different but not divisive as long as a little mind adjustment is applied. However, it did not take long to delve into its delicate parts and reveal an artist in a hungry mood to tastefully propel their music forward. If you splice the professional career of Ashley Monroe with the initiation of the Pistol Annies project, SPARROW is the third album in the second phase, of which the first one was defined by the early years of chasing the Nashville dream. In a major shift from the two most recent albums LIKE A ROSE and THE BLADE, this record relies heavily on an abundance of lavish stringed arrangements, casting traditional country or pop pretensions to one side, at least for the moment. The big decision at the outset of this project was to hook up with prolific producer Dave Cobb, certainly providing him different tools to work with than those of Jason Isbell, Chris Stapleton, Sturgill Simpson and, more recently, Brandi Carlile. The magic has worked as a whole, with at least half of the twelve tracks getting five star appreciation here. While its mainstream release on a major Nashville label will tag the album country (for a truer exposition of the genre you need to look elsewhere), it is far more aligned to seventies countrypolitan, think metro Dolly rather than mountain Dolly. An interesting connotation seeing both artists hail from Eastern Tennessee. Ashley has hooked up with a host of established writers, albeit having a co-role herself in the penning process for each song. From a personal awareness perspective, three names jumped out of the page immediately, led by Pistol Annie colleague Angaleena Presley, who assisted on the highly personal ‘Daddy I Told You’. This is one of the half a dozen tracks with most appeal, and while the overall album does not have an Angaleena feel to it, this track in honour to the father Ashley lost in her teenage years definitely does. The second familiar name also had an abstract Pistol Annies connection, with Miranda Lambert’s current partner Anderson East getting in on the writing act. Likewise to the Angaleena statement, you could not envisage Miranda making an album like this, but the track in question, ‘This Heaven’, does have her spiritual stamp all over it. Before we get back to pick of the album, the third track which raised the eyebrow on the writing front was the momentum building ‘Hard on the Heart’, which had Blu Sanders on the credits; an artist who worked on the similarly excellent Gwen Sebastian album last year. There is no finer place to start when returning to the album’s high spots than the opening track ‘Orphan’. This uplifting powerful yet tender number leans heavily on the cello and adopts a pondering mindset early on with the line ‘how does the sparrow know more than us’. It does not take long to decipher that this album is going to be different, but the ease at which this song grows on you suggests it is not going to be an overtly long process grasping it. ‘Hands on You’ was the first track to surface online and initially presented me the conundrum of not matching up to‘Like a Rose’, her benchmark track in my opinion. Eventually, this mellow sultry and moody song won me over, and while the original assertion is still valid, it improves in the context of the album. Soaring to greater heights than the humble ‘sparrow’ are two tracks delectably different in their feel. You can focus on ‘Mother’s Daughter’ from either, the perspective of Ashley’s recent motherhood or any other parental aspect, but it evolves into the most wonderful of choruses and is an early candidate for the top spot; should one desire. ‘She Wakes Me Up’ spices up the album in retro soulful stomper mode and filters in an older sound that can give many Americana releases a edge of finesse. In line with the album opener being exceptional, the closer similarly fits the bill. Maybe gospel or secular in intent, ‘Keys to the Kingdom’ keeps you lyrically aware in the album's closing moments. Perhaps acknowledging that the spiritual can act as a conduit for the blessings granted to make beautiful music. Of the remaining tracks, ‘Paying Attention’ has been one of those made available early in the album’s pre-release phase. It is probably representative of the album’s overall feel, without creating the initial effect that the indicated ones have. Likewise, the trio of ‘Rita’, ‘Wild Love’ and ‘I’m Trying Too’ see the album sink into a zone that soothes without excting too much. However, they fit neatly into the vibes that emanate distinctly from a record that will have to fight hard to find its market niche. That last point is a mooted observation of where this album may lead. It should not abandon fans that have grown on Ashley over the course of her last two releases or the Pistol Annies work, but, does it have the bite to make inroads elsewhere? In a perfect world where the craft of a deftly spun body of work effortlessly melds into a gorgeous vocal presence, success should prevail. However, we often know the reality. 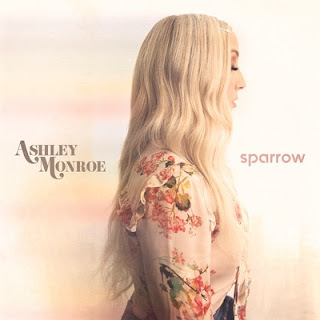 Regardless the album direction of SPARROW, being on board with Ashley Monroe in that ever-diminishing corner of desirable mainstream Nashville is a comforting place to be. Maybe we are sometimes guilty of wanting to mould an album too much into our own model. This one is an exception.